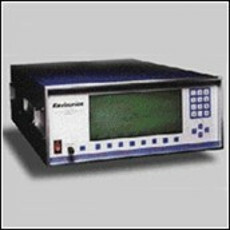 The Environics® Series 9100 Computerized Ambient Monitoring Calibration System is an advanced microprocessor controlled instrument for dynamic calibration of ambient air analyzers. ** Now available with a 3rd Mass Flow Controller! ** The Environics 9100 is the unit of choice in the Air Quality Monitoring Programs of the EPA and California Air Resource Board (CARB) The Series 9100 consists of a single chassis supporting up to 3 thermal mass flow controllers, an ozone generation module, a mixing zone, a reaction chamber for gas phase titration, and control electronics. Commands are entered from the front panel and displayed on a backlit 25 line by 80 character liquid crystal display. The instrument may also be operated using contact closures or an RS-232 serial data interface. The mass flow controllers are calibrated to a NIST (National Institute of Standards and Technology) traceable primary flow standard. The calibration data consists of a comparison of desired versus actual flow over the full dynamic range of the instrument, with linear interpolation between points. Calibration data is stored in the non-volatile memory and may be updated by the user with a suitable standard. The Series 9100 ozone generator is factory calibrated using a NIST traceable ozone standard. This temperature controlled, ultra-violet (UV) based ozone generator includes a precision photo-optical feedback circuit to compensate for lamp aging effects as well as built-in pressure compensation. The Series 9100 is available in either a standard 19" rack mount or bench top configuration. Find online auctions and classified ads for air monitoring and lab equipment on LabX.